They communicate a message very efficiently without the use of a large body of text which can be difficult for your target audience to digest. The big advantage with infographics is that they can be used on the web or in print to reach your audience on whatever medium they prefer. Our graphic design team create a combination of icons, illustrations, and/or data visualisations that result in unique pieces of visual content for your business. These infographics show content rather than just talking about it. A great infographic gets straight to the point and captures the audience attention using graphs, charts, icons, symbols and stylish illustrations - they are the perfect companion to text-heavy documents or presentations. They can also be used very effectively on social media. An Infographic can either tell a story or present the facts and let the audience create their own conclusion. We work with clients to identify the objectives of their communications so that the infographics that we design always meet their goals. Do you need infographics to effectively communicate with your target audience?  Meet with our graphic design team and see how we can create the right graphics for your communication needs. 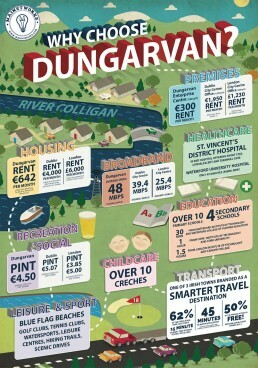 Bespoke infographic illustration for "Why choose Dungarvan?"